Happy National Bundt Cake Day! I have been looking forward to this day to try new recipes and, as it turns out, I went totally predictable and went seasonal. Boring. But my taste buds aren’t complaining. If you have 30 seconds PLEASE go check her out. It is because of her that I even know of this holiday. She has been leading up to this day with 30 bundt recipes! Seriously, bundt cakes are her passion and we get to reap the benefits with pictures that make me want to lick the screen. Hmm, not sure that’s a benifit…but anyways she is amazing and dedicated to say the least. And creative, meatloaf bundt anyone? Personally, I just have fun looking at her pictures, she’s the one who makes the cakes at 5:30am. Hah! OK, so enough rambling, just go check out her blog. Here is my bundt cake to celebrate this very special, very sacred holiday. 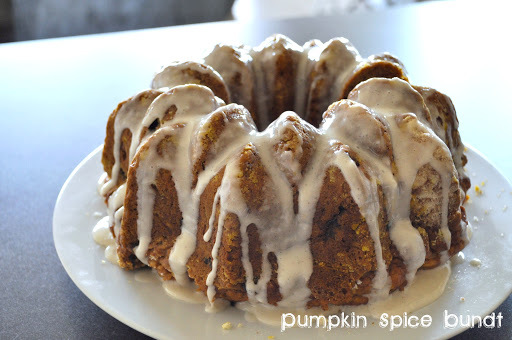 My Bundt cake is a Pumpkin Spice cake with raisins. Topped with a Vanilla Glaze. I double glazed it. Double the calories. Double the goodness. I also froze the mini’s for a dreary day. Planning ahead. For when I’m feeling lazy wanting to surprise Travis with a dessert. I remember this day from last year!! Delicious! !